the other. Getting the right pair is easy. In this review, we’ll look at the best sets of nail clippers on the market and look at how one differs from the other. The Clyppi Nail Clippers are similar to the nail clipper we just covered above in that they tend to be very easy and comfortable to handle. This is achieved through both the “ribs” used in its upper handle’s make, as well as the width of its upper and lower handle. However, you may find these nail clippers to be at least somewhat less ergonomic in nature, perhaps leaving them inferior to the product we covered above if your main priority is getting a pair of nail clippers which is very ergonomic in nature. On the other hand, this pair comes with its own nail file, making it more suitable to those who already use nail files in the first place through offering everything you need in one little package. Of course, if you don’t already use a nail file and you don’t plan on starting to use one in the first place, you may prefer the Klipit. Made with aesthetic appeal in mind, you’ll find the Seki Edge Steel Fingernail Clippers to be the sleekest pair of nail clippers on the market. Of course, this isn’t exactly the most important thing to look for in a pair of nail clippers, though it’s certainly a nice added bonus. Such as the above two products already covered, you’ll find this particular product to perform equally well in terms of its ergonomic handles. This effect is achieved not through the materials used, nor any significant amount of “ribbing.” Rather, you’ll find it to be curved in a way that almost gives your thumb its own slot in which to fit. Outside of its ergonomics, you’ll also find it excels in the realm of effectiveness through its sharp blades. Like the other two products on this list, the sharp blades in question don’t only increase the product’s effectiveness, but actually increase its overall level of durability and make it safer to use. 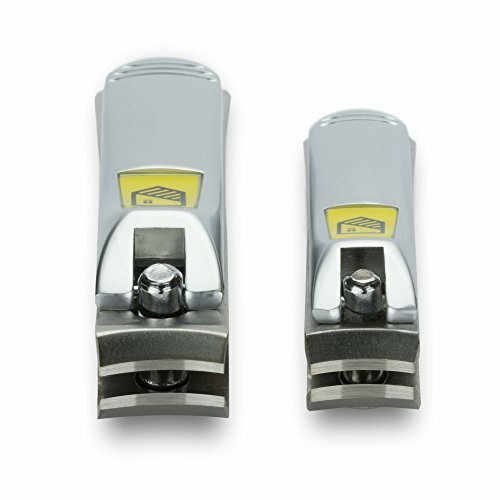 These nail clippers also come at a price which is relatively low when you consider their quality. For fifteen dollars, it’s hard to find an equally-great pair of nail clippers. You will likely notice something is different about the Harperton Klipit upon immediately laying eyes on this set of nail clippers. It becomes apparent rather quickly that the manufacturer had no intention of following the standard formula we’ve all become accustomed to in the building of products of this type. And, as it turns out, it is this very stray from the typical formula that makes this set of nail clippers so great to begin with. For example, you’ll notice its best characteristic to be the feel about it – not the feel on the nails it’s clipping, but the feel in your hand. Simply put, it’s very ergonomic. If you’ve used multiple sets of nail clippers in the past, you’ll notice that this goes in great contrast to the many products on the market which seem to represent nothing more than a jumble of thin strips of metal. This is a rather refreshing feature and is one I’d like to see in all similar products across the board. Outside of its shape alone, you’ll find you get a great grip on this product through the materials used in its make. This is another feature which is rarely seen that also goes on to further increase the grip it offers. Outside of its great feel, it also performs well by all of the standard metrics of quality. Its blades, for example, are extremely sharp. Not only does this make cutting your nails easier, it’s also a well-known fact that sharper blades are safer than duller blades, being that they require less fidgeting around with when trying to get the job done. You’ll also be able to get quite some time out of this pair of nail clippers before its blades start to become dull, giving it a high degree of durability. Of course, this type of durability is something you want to see in any product. If you simply just want something to cut your nails with, any of the above products are sure to work perfectly. However, taking the extra minute to figure out which pair of nail clippers will work best for you can net you with a product you’ll be happy to own. For example, if you want the product which is the very best at performing as a standalone set of nail clippers, the Klipit is easily your best option. Through its sharp blades and very ergonomic build, you’ll find it does a great job in this regard. If; however, you’d like a pair of nail clippers which boasts an added degree of convenience, the Clyppi is sure to be a winner through its small stature and its included nail file. On the other hand, many of us simply want the cheapest product available that still functions at an above-average level. If this sounds like you, the Seki Edge’s highly functional nature and low price will give you exactly what you’re looking for. While it may make a few sacrifices to bring its price down in the first place, it easily has the best price-to-quality ratio and, thus, value among all products of its type. 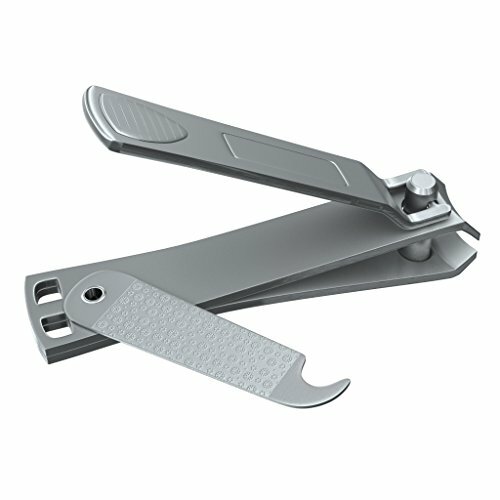 What is a Nail Clipper? If neither of the three above products seem to be just what it is you’re after – not to worry. Shopping on your own can still have you walking away with a great product. To find said great product; however, it helps to know what you need before going into shopping in the first place. Here are some things to keep in mind. Do you need a nail file? Even if you don’t, it can be easy to assume that an included nail file is better than no nail file at all. However, included pieces don’t always translate to a higher degree of quality. If you’re certain that you will never end up using the included nail file, you’ll be able to get a product which either has a higher degree of quality or a lower price by opting for something which doesn’t have you paying for features you won’t use. Remember, if everyone needed their nail clippers to come with a file, nobody would make nail clippers that don’t come with files. To get the highest degree of value possible, it’s important to only pay for features you actually plan on using. On the other hand, if you do need a nail file, you’re almost always better off getting a set of nail clippers that comes with one. This is due to the fact that when you buy a file separately, you’re paying for another company’s packaging, marketing costs and store profit margin. Buying your nail file separately from your nail clippers will almost always prove to cost more in the end. Simply knowing what you need before settling on your product of choice is sure to net you with some savings here and there. How big should your nail clippers be? If you’ve spent any amount of time shopping around for nail clippers online, you’ve likely come to the conclusion that, unlike most products on the market, nail clippers seem to be getting bigger and bigger. Of course, if you need something very light, such a feature may prove to be more of a burden than anything. Bigger nail clippers are also usually somewhat costlier as well. However, bigger nail clippers also have the potential to offer their owners a higher degree of quality. For example, all of the most ergonomic nail clippers are of the larger variety. This is also true of the most durable and more easy to use nail clippers as well. As such, unless you have a good reason for getting smaller nail clippers, bigger is always better. If; however, you find yourself indifferent to many of the great features found in larger models, you may save yourself an extra couple dollars here and there by always opting for nail clippers which come smaller in stature. Of course, such products will also be a lot more convenient if you plan on taking them out of the house. There are a wide variety of more advanced features which may be found in all sorts of nail clippers. Advanced; however, does not necessarily mean better. Whether or not any of the below features would be catered to you all comes down to your own needs. Do you know which features you could use in a set of nail clippers? A Nail File – We’ve already covered this, so I’ll be quick. Unless you know you’ll use a nail file, you’re better off refraining from products which have one built in. Large Blades – I mentioned previously that larger units may come with more agreeable features. However, this applies to the overall size of the unit, not the size of the blades themselves. Unless you plan on clipping your toenails with your new nail clippers, getting a unit with smaller blades will always prove to be more convenient. On the other hand, if you’re unsure or simply want something more versatile, a unit with larger blades will almost always save you money in the long run. Separate Clippers – Some nail clippers come in sets featuring both toenail and fingernail clippers. Of course, this will be the most comfortable and convenient option if you plan on clipping both nails. On the other hand, you may save some money – while sacrificing a bit of comfort – by going with a set of toenail clippers, as these will work on all your nails. You’ll need to choose between comfort and frugality. There is no right answer, only your personal preference. The above features have you choose for yourself just what type of product you’d like to walk away with. There are; however, a small number of features which you should always look for in nail clippers of any sort. Sharp Blades – By going with a set of nail clippers that is known for having extremely sharp blades, you can bet you’ll be paying a bit of a premium for the privilege. While this may initially scare you away, it’s worth noting that such nail clippers will always save you money in the end through their higher degree of longevity. A Nail Cleaner – Whether or not you want a file in your nail clippers is entirely up to you. However, if you do decide you need a file, it’s always a good idea to get one that also acts as a nail cleaner as well. Because this characteristic is marked only by the shape of the file’s tip, you can be sure it costs next to nothing to implement into a product. As such, it only makes sense to look out for such a feature if you already plan on getting a file-equipped set of nail clippers in the first place. As you can see, with the exception of the three features listed above, it’s hard to say there is one best set of nail clipper features on a universal level. Although we covered three nail clippers which are of the highest quality by every metric, it’s up to you to decide which features are best for you. By keeping all of the above factors in mind, you can be sure the nail clippers you choose to go with can save you time, headaches and money in the long run.